In the last decade Pluto has gone through a lot of controversy around whether it’s a planet or not. However, controversy aside there are some really cool discoveries happening in the just the last month or so. We’re going to take a look at my favorite 5 things about Pluto that you may not know about. Please let me know in the comments below of a Pluto fact that you really found interesting or fascinating. Pluto’s color is a lot different than some of us had imagined. I thought it might have been blue because it’s considered an icy dwarf planet. However, that is actually not the case at all here. First off Pluto has two contrasting colors – beige / dark orange and to me what looks like a grey or grey with a tinge of blue. Actually, the internet had represented Pluto in either red or blue. So I’d think it’s safe to say it surprised most of us. The intricate spots and swirls really excite me and I CANNOT wait until we see very up close and personal images of Pluto itself on July 14th! Another reason Pluto is crazy cool is that it has these weird looking moons! 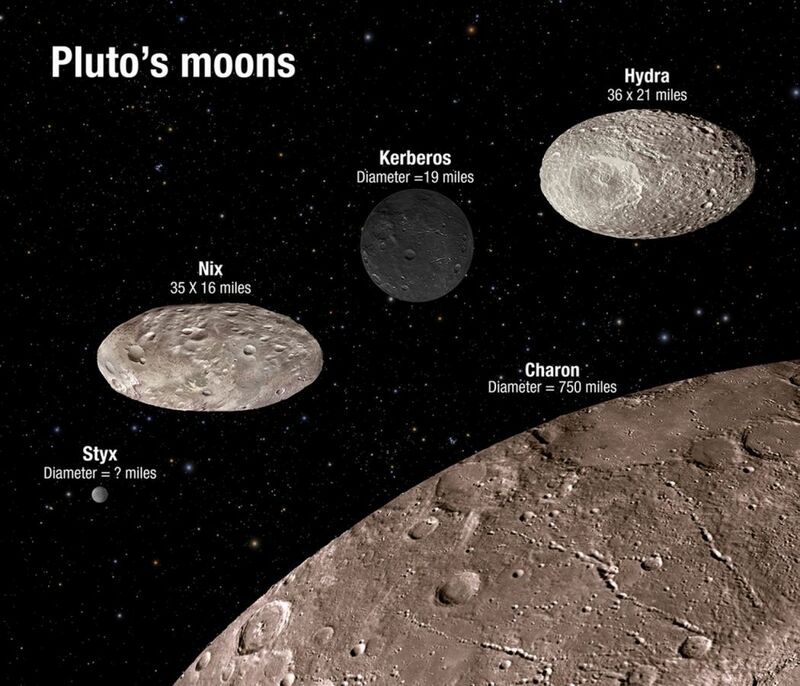 Of course, Pluto itself is a maybe a little smaller than our own moon so we can imagine if Pluto has moons they are probably not that big, to begin with. However, some of these moons are almost like mini footballs rotating chaotically around Pluto (we’ll get to that in a second). So if there was another surprise to mark on our list it’s how Plut hosts some pretty weird characters – something that reminds me of Mars’ potato-shaped moons. Who said our solar system wasn’t incredibly intriguing? OKAY this is actually really interesting. So pay close attention. The moon Nix (shown in the video above) is sooo weird that it can actually flip its poles. In fact, you could watch the Sunrise in the East and then set in the North that very same day (M. R. Showalter, Nature). It’s absolutely mind-boggling! You can see why scientists get very grumpy (as well as excited because they love problems) in trying to predict Nix’s rotation. Actually, the rotation periods vary from 400 to 450 days. That would really mess you up on trying to figure out how old you are in Nix years! So why is Nix’s rotation so weird? Well, it’s because it’s caught in this very strange dynamically changing gravitational field caused by Pluto and Charon (gee thanks guys!). It causes Nix and Hydra to “tumble” which is exactly what happens to Saturn’s moon called Hyperion. Even more so, Charon and Pluto are tidally locked to each other so if you were an observer on the North or South pole you would only see the same thing year round. Check this out: Here’s an animation created by NASA on what that looks like. Either you are a blue person and you would only see Pluto or Charon – or you are a red person and you would never see Pluto or Charon. 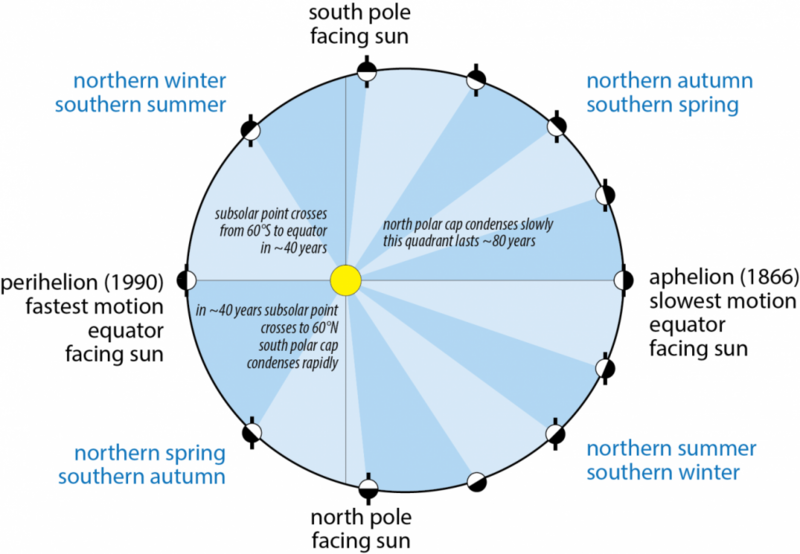 Since Pluto is tipped on its side the seasons are more exaggerated. For example, the amount of sunlight varies by a whopping 280% vs. on Earth where it only varies by 5%. Also, Pluto is ridiculously far away from the Sun (5.8 billion km or 3.7 billion miles) so each season lasts for decades! What do you mean when you say “Pluto spins in a different way than the rest of the planets?” It does not have a retrograde orbit. Looking at the spins of each planet in relation to the Sun – Pluto spins in the opposite direction like Venus and Uranus. Here’s one source you can look at http://spaceplace.nasa.gov/ice-dwarf/en/ or https://solarsystem.nasa.gov/planets/profile.cfm?Object=Plu_Charon. If this is not the case do you have a source or explanation? I would be open to correcting it if that is not the case. You are probably mixing up “to orbit” and “to spin”. 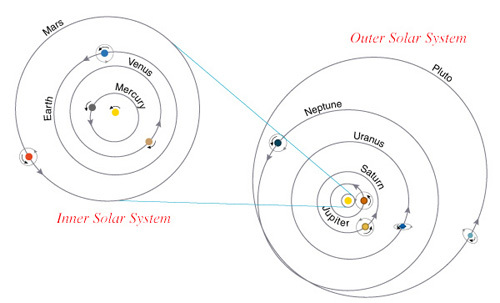 Pluto orbits (around the Sun) the same direction as the other planets. However it spins (around its axis) the other way round than the other planets.